The closest and easy-available way to visit Baikal lake if you are short in time. It takes about 40 minutes of drive over paved road to get to Listvjanka village of the shore of Baikal lake. Here you can visit Baikal nature museum which has a rich flore and fauna collection of the deepest lake in the world. For it`s majesty and fascinating glory, the lake is called the Sacred Sea by locals. The only river which flows out of the Baikal is his daughter - Angara which brings its waters to Irkutsk and further to Enisey River. In the middle of Angara source there is the Shaman`s Rock which according to the local legends has some magic power and blocks the entrance to the undeground spirit world. You may take your time walking along the main street, buying souvenirs and trying famous speciality - tasty smoked local fish - Omul! 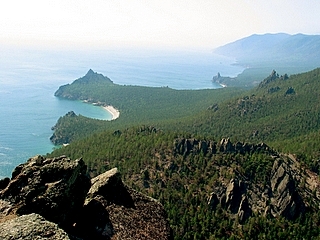 Listvyanka is the start-point of Baikal ecological trail (Big Baikal Trail) which runs along the shore northwards. It`s possible to organize different kinds of trekking trips from one-day excursional up to several-days hike journeys. 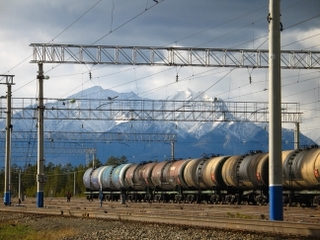 The Circum-Baikal line used to be a part of Transsiberian Railroad which joined two great branches - Eastern and Western rail lines, disconnected by Baikal lake. It was called the "Golden Buckle of Russia`s steel belt" due to the transcendental cost of the construction. The shoreline landscape which is mostly represented by high rocky cliffs and walls made a great difficulty for construction of this railroad. One kilometer of the track required 400 train cars of soil, which is comparable with the volume of work on the Suez Canal. One kilometer needed about one train car of explosives. There are lots of bridges, tonnels, galeries and other constructions on this railroad. For the whole length of Circum-Baikal line (less than 100 km) 39 tunnels were built, with a total length of 8994 meters. For the present moment this part of Transsib is not included into general railroad line and it became an open air museum. There is not much traffic on this railroad, only few local and excursional trains. The road starts from the dead end in Port Baikal (small settlement across Listvyanka village), goes along the picturesque southern shore of Baikal lake and joins the main Transsib line in Sludjanka city. 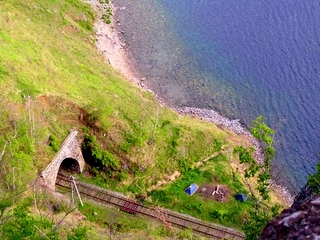 It`s possible to have one-day circle trip by excursional train through the Circum-Baikal line. If you are in Irkutsk and would like to travel along the Baikal shore there are several options for you. All the shoreline of Baikal lake starting from Listvyanka village and up to Olkhon Island is available for organizing different kinds of tours. It`s possible to get to some places of the western shore by car, but some areas don`t have any roads, so you can explore its preserved and wild nature only by hike. All the western shore can be divided logistically into several parts. First part includes the distance from Listvyanka village to Bolshoe Goloustnoye village which is situated 50 km upnorth. This stretch of the shoreline is famous for the recently build Big Baikalian Trail, which makes trek trips along the shoreline available and easy for everybody. Usually you need 3 days for this trek. The route of the next part (from Bolshoe Goloustnoye village to Buguldeika village, about 100 km) runs through deep Taiga forest and chain of gorgeous rocky cliffs of the Baikal shoreline. This trek is taken by the tourists very seldom because of difficulty with orientation in great number of narrow forest trails. because of absolute absence of roads and rare visiting by people this area has kept its original genuine Baikal nature. In the middle of this distance you can find lonely touristic camp which is connected with Irkutsk city by the regular public hydrofoil boat. So you can choose either to continue your trip up to Buguldeika village or spend some time at the perfect sandy beaches and get back to Irkutsk by boat. The last stretch of the Baikal shoreline from Buguldeika village to Olkhon Island (about 100 km) has a big variety of the forest roads which gives a good opportunity to travel here by 4WD vehichles. This area is well known for cultural sights, such like shaman`s sacred places and ancient walls and rock drawings well preserved till the present days. One more lanscape speciality of this area is mongolian looking Tageran steppes which represent the Baikal shoreline for the last 45 km before Olkhon Island. Olkhon island has the biggest amount of sunny days per year - so it`s called the Sunny Island! 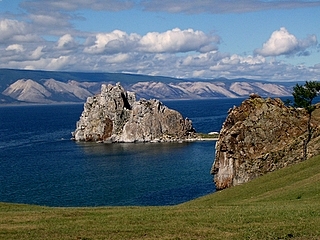 It has the richest variety of Baikal landscapes which are gathered in one island in the heart of Baikal lake. You can find sandy beaches, georgeous cliffs, deep Taiga forest, vast steppes and even a small desert which are closely combined. 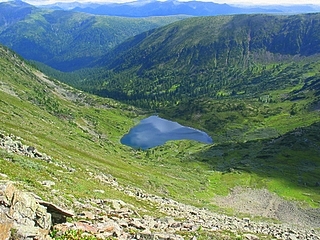 Olkhon itself resembles the shape of the lake and is considered to be the sacred center of Baikal. There are many homestays and guest houses in the main village of the island - Khuzhir. 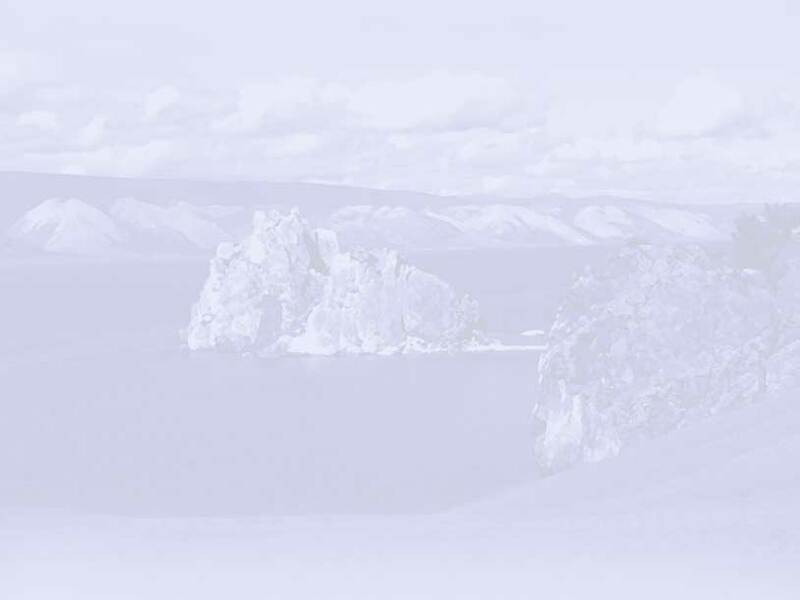 You can easily stay in any of them and have different kinds of activities, such as trekking, mountain biking, cayaking or car excursion to see the most spectacular sights of Olkhon Island! Olkhon is 350 km away from Irkutsk and it takes about 4 hours of drive to get there. The road is mostly paved but the last 100 km stretch is gravel. 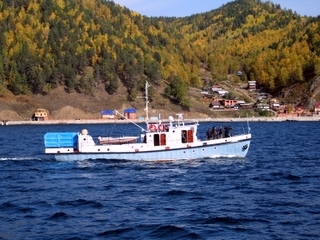 To get to the island from the mainland you need a ferry boat to cross Olkhon`s Gate strait. Honestly speaking, it is usually quite crowded during high summer season. We suggest to visit this place during a period from September up to end of March. This region is perfect for those who want to explore the severe, beautiful and pristine Nature! There is hardly any mass tourism at this area for the reason of weak development of infrastructure. On the other hand all this area is quite accessable because of existance of BAM Railroad (Baikal - Amur Main Railroad). It is an alternative variant of Transsib which goes through Northern Baikal to the far east of Russia. BAM railroad opened a door to the wild and untouched nature and brought new possibitities and prospects for travellers. Moreover, northern Baikal easily reachable from Irkutsk not only by car, but also by plane (2 hours flight), train (2 days) or boat. The best possibility to get there in summer time is public hydrofoil boat (1 day trip) which is available twice a week for the reasonable price. There are a lot of unique landscape and cultural sights: a small desert in the middle of tundra, glatiers and huge waterfalls of Kodar mountains, old former USSR prisons (GULAG), last settlements of original Siberian natives - Evenk people, hotsprings and volcano valleys. Your trip to this area will leave a vivid, profound impression! 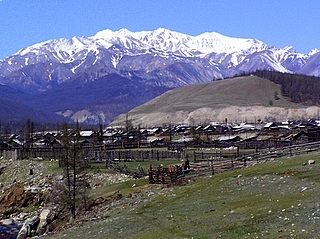 Sayanas is a huge mountain country which occupies a vast area on the southern side of Baikal lake. It takes only 3 hours of drive over paved road to get to Tunka Valley which is in the foot of the Sayan Mountains. On the way there the road passes the southern corner of Baikal lake where you can stop for lunch at the cafe admiring the beautiful view of the lake. Further the road turns directly to the south and through the pass in the Taiga forest brings us to the Tunka valley. Along the road you`ll see the vast steppes surrounded by snow-covered rocky ridge of Sayan mountains. Tunka valley is famous not only for its mineral and thermal springs, but also for deep and mysterious canyon of the Kyngarga river with very close and accessible mountain peaks and huge icefalls, which give a lot of opportunities for ice-climbing. Besides, there are lots of cultural sights of local natives - Buryats, such as Buddhist temples and shamans praying places. Both religions - Buddhism and Shamanism - are closely combined here in a specific way. In summer you can discover the beauty of Sayan nature by interesting hiking and trekking tours around its mountain area while in winter ice-climbing, mountain skiing and snowbording are more popular. The ridge of Hamar-Daban stretches for the distance over 250 km along the southern shore of Baikal lake. These mountains are one of the oldest in the world which makes its landsape quite smooth and deep woody. This place gets the biggest amount of precipitation in the whole Baikal region because of its geographical position. In winter there is much snow and sometimes its depth can reach 2.5 meters! The only way to travel there in winter is specially prepared wide hunting skies. If you want to experience what a real Siberian wintry Taiga forest is - you should definately come here! After a heavy snowfall you`ll find that all the branches of the trees are covered with thick layer of the snow which gives an impression of being in a fairytale forest! You can tell how many animals live there by reading and counting the numerous footprints left on the snow of different siberian animals searching for food. You may be lucky to meet some of them! Here you`ll have a rare opportunity to meet hunters from one of the locals who are still trapping for the diamond of Siberian fur animals - Siberian sable. There are lots of good places for organizing snowshoeing trips which give you a chance to explore the most wild and untouched corners of Hamar-Daban mountains. In summer this area is really great for hiking, mountain biking and canoeing. Taiga forest is full of wild berries and mushrooms which grow along the mountain streams and lakes with crystal clear waters. Local rivers have lots of waterfalls which gives you a nice opportunity for taking memorable pictures!